This sprawling 1 hectare country property on the boundary of the Don River and situated amongst the magnificent mountain ash gum trees of the Don Valley has had an extensive makeover by its new owners in the last few years. Visitors will find themselves wandering to many surprising features throughout the property. A meandering mixed border garden welcomes you to the front garden and at the rear of the property the Don River boundary invites you to enjoy a stroll along the river. A brook, with wet area and shade loving plantings, mulched paths and garden beds surrounding the several ponds, bridge and gazebo add to the tranquil bush setting. A partially enclosed vegetable garden, chicken pen and yard, a bee hive and many old fruit trees produce an abundance of fresh eggs, vegetables, fruit, berries and honey. Our garden was devastated in the wind storm that ripped through the Don Valley in October last year and among the loss of many newly planted trees and shrubs, we lost eight huge gum trees as well. It was a mammoth six months clean up but we and the garden are slowly recovering. Hello and welcome to our garden. When this property was purchased in October, 1986, there was a small fibro cement home just 20 ft. X 30 ft., being used as a weekender. The land was predominantly native bush with some clear patches of very hungry ground. The only non indigenous plants on the five acres were two lemon trees of which only one remains. Our garden has just fallen into place without planning and we never know what we will do next. We have just discovered the wonderful world of succulents and have just planted many different varieties, including salvias, around the front dam. So please enjoy the sharing of our garden with us today and should you see a little brown English Staffordshire dog around, her name is Ruby and she loves a pat. In her 10 years, she has planted every tree in the garden with us. I purchased the block of land and my home was built in 1983. My intentions were to have a small garden and play a lot of golf as it backs onto the course. I Living in an area where the soil and climate are so favourable to gardening, the garden won. Ground covers bulbs, shrubs, trees including fruit trees plus a small vegie patch make up the garden. The growth over these years has been incredible. As you will see I do not need to own a lawnmower. As the larger trees developed I have added a shaded planting of ferns, hostas and other plants. I do hope you enjoy your visit to our gardens. When we moved to this 1 acre property in mid-2010 there was virtually no established garden. The exception being 7 Washington Navel oranges along the back-retaining wall. We have since added a variety of limes, lemons and mandarins to that orchard area. Opening directly onto the 18th fairway of the golf course, the garden was constantly ravaged by roaming deer so the first task was to fence the entire property. Planting then began in 2013. The slope of the land was difficult on the eye so we decided to ‘flatten’ the western area with a series of interconnected pools. The whole idea of this garden is to be low maintenance, restful and interesting at all times of the year. The garden of Projekt 3488 surrounds the historic former Warburton Masonic Hall in an envelope of green. In both the previous incarnations of a yoga studio and the Masonic Hall, the rear yard was used as a car park. The previous owners had planted a grove of eucalypts in the front and one at the rear. Designed by owner Mark Fenech, the landscaping has two main inspirations; the setting, and the inspiration of his mother and her love of particular plants. The garden has to withstand two large dogs, tolerate the conditions of frosty winters and hot summers, and be relatively maintenance free. It needs to work well for the functions that Projekt 3488 holds, such as weddings and special events. There is extensive use of sleepers to form a wheelchair-accessible boardwalk through the garden. This references the former Warburton train line that ended just across the road. The pebble-filled ponds were inspired by hanging out by the river in the summer; they bounce light around the garden and create beautiful reflections. The frogs, it seems were watching, and had moved in a week after the ponds were dug. This property is in two parts: the garden around the house of approximately ½ an acre with an outlook to Mount Victoria. This is predominantly ornamental, however there are 5 massive Manna gums on the eastern and northern boundary, 2 giant Californian redwoods, and some large blackwoods. There are many mature rhododendrons and camellias, the majority of which are pink as this was the previous owner’s favourite colour. 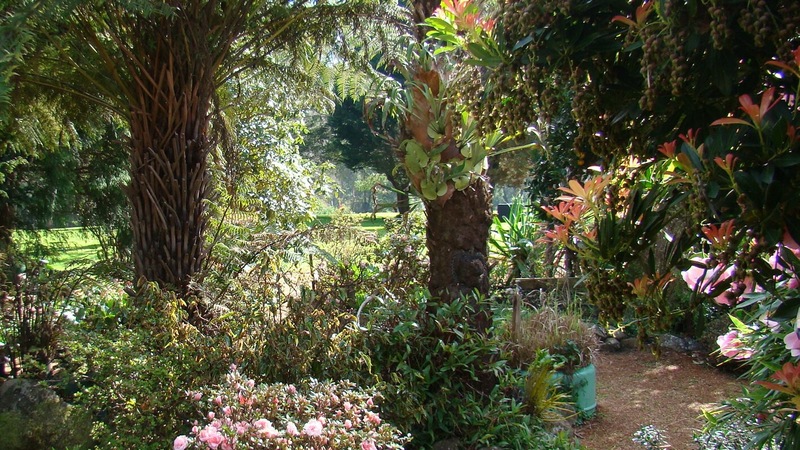 The second part of our garden is 4 acres of native forest. Here you will see more Manna gum, Mountain Grey Gum, Messmate, Tree ferns, Paperbarks, Black wattle and Blackwood. The forest and garden is home to a wealth of wildlife including a wallaby, wombats, deer and foxes. Birds include kookaburras, crimson rosellas, king parrots, currajongs and even the elusive Wonga pigeon. You are most welcome to explore the forest which has a creek from La La Falls and a pond.